About time this gets a premium. I want the Drew Struzan original poster art as the lenti. Yes finally, 100% need a Slip with Struzen's artwork. Feel kind of dumb for buying the Amazon JP steel. Here we go. 500 print run isnt enough. Defo need this one !! A proper deep lenti please. A lenti magnet would be much better! Poor quality SB. Recycled BD-25 sub-par encoded recycled disc. oh sweet, glad I held off buying the steel! please put the 4k in this, pretty please!! Forget to tell everyone,due to china customs always open the package to check the magnetic,so we cancel the magnet lenti on this release. I'm so dumb. I thought this thread was double posted by accident and didn't realize until now that both the original and 2049 are being planned. Doh! Anyway, I'm in for both. I would never admit this publicly, of course, but--I thought it was a double post the first couple times I looked at the board, too. Dear HDzeta, please do some alchemy and turn silver into gold! And for 2049 too! Seriously, Blade Runner has a huge following and this will be an instant sellout even at a much higher quantity. Pretty please with sugar on top? So LA Confidential and Argo got Gold Label releases but not this?? 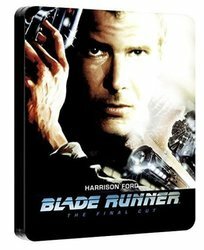 Argo might’ve won Best Picture but Blade Runner is in a different league and would’ve been an instant sell out if WEA. Plus I can bet the newer Blade Runner will get WEA from one of the retailers. Missed opportunity, HDZeta. Still might get this though. Nobody else is doing the original Blade Runner in premium form as far as I know. Manta hinted a little while ago that they were working on Blade Runner, and they only do WEA. So there's a possibility we'll see a premium WEA edition eventually. Yes, we don't want customs opening our packages and pawing them with their grubby little hands! It depends on the approval phase. If the studio will not approved new artworks then they will most likely use WWA steelbook artworks. Nothing to do with missed opportunity.